Dave was born on January 14, 1922, in Vancouver and passed away peacefully on December 21, 2013, just shy of his 92nd birthday. His father, Professor Harry King, was one of the founding fathers of UBC’s Department of Agriculture and his mother, Aletta King, was active in the Faculty Wives Association. 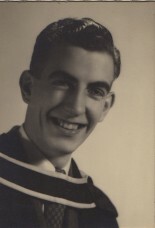 In 1945 Dave received degrees from UBC in agriculture and commerce. He married Ruthy Parnum in 1949 and lived in Langley, where he was district manager for the BC Electric Company. Dave believed passionately in the ability of the free enterprise system to create a bigger pie that could be shared by all, and devoted his career to pursuing the economic development of BC. Dave, Ruthy and their children, Julia, Harry and Anne, moved back to Vancouver in 1960, settling in Kerrisdale near his parents. Following the expropriation of BC Electric, Dave remained with BC Hydro and later served as executive secretary of the BC Harbours Board and as a commissioner on the BC Energy Commission. He played key roles in the development of the Peace River hydro project and the port at Robert’s Bank. Dave and Ruthy moved to West Vancouver in 1974, where they enjoyed a tranquil setting, great bridge club, and their four grandchildren, Christopher and Eric Mueller, and James and Aletta Leitch. Following Ruthy’s untimely death in 1993, Dave married their long‑time friend, Sally Carter, and after her death in 1998, married Gail Gillespie who passed in January 2013. Dave was a devoted son, cherished husband and responsible father. His children fondly recall family excursions where “taking the scenic route” often resulted in finding the latest pulp mill or highway construction project, and time in ferry line‑ups was spent doing mental math games. He lived a good life, was well loved, and will be missed.